Van Witt Fine Art Conservation had the honor of performing an assessment for conservation and restoration of the Winfield School District art collection of 148 pieces in the Fall of 2014. We gave proposals, for the conservation, storage, and presentation for the entire collection. Seven works of art from the collection were chosen for restoration. This project included two paintings and five works on paper. The first work on paper measuring 16x20 is a Birger Sandzen lithograph titled "Sunflowers", 1930, it was extremely acid burned due to a corrugated cardboard backing which had darkened and discolored the art. A conservation treatment for acid burn drastically lightened the print. It was reframed with conservation glass and non acidic mat board. The oil painting by Birger Sandzen titled "Kansas Landscape" 1934, had paint that was cracked and delaminating in the heavy impasto layers. The layers of the paint were starting to separate and curl apart. After the painting was cleaned of airborne grime it was lined on a heated suction table with a heat activated thermoplastic adhesive. This process laid the cupping paint back down to stabilize the layers. Losses were filled, and it was in painted with reversible paints and raw pigments. The painting was reinstalled into the cleaned and restored frame and is now suited for public display. This painting came into our studio stapled onto a piece of cardboard. It was off the stretcher bar and had a large tear that someone had tried to repair with wax. It was very disfiguring. This is how a wax repair looks from the back. We do not recommend this method. First of all, it saturated the entire canvas, discolored the front and did not fuse the tear together. In order to reverse the planar distortions, we lined the painting on our heated, suction table whose primary function is to provide control during various treatments. The above photograph shows the painting after it came off the suction table. As you can see, the tear laid down flat and fused together after the treatment. The wax from the old repair is still evident but will disappear after further treatments. Here we have a final photo after cleaning and treatment. The painting has been brought back into plane and the old tear and repair are no longer evident. From paintings to murals, from pottery to sculpture, each form of art requires a specific method of conservation. Conservators have post graduate degrees in a specialty. Specialties in art conservation include ceramics, furniture, sculpture, bronzes, and oil paintings. This article will address what happens when you bring a painting to Van Witt Fine Art Conservation. When many people hear the word "art" they envision a painting. This expression of creativity has been practiced by humans since we began to paint on the walls of caves thousands of years ago. And much like the art-form, the artwork too, is quite old - much of it in need of repair, restoration, and thorough conservation. There are many reasons why a particular painting may need to be conserved. It may be dirty, cracked or torn. The varnish may be darkened or yellowed. Whatever the reason may be, there are many different methods used in conserving paintings. First we will examine the object before suggesting a treatment. Next our conservator will provide you with a written estimate and describe the proposed treatment, expected results, and estimated cost. Should the treatment seriously deviate from the agreed upon proposal you will be contacted with an adjusted proposal. Below is an example of an oil painting that has been conserved and restored. The actual technical process of the painting's conservation involves several standard steps. The first step is chemical in nature. Pre 1940, most oil paintings were covered in a varnish to protect the paint and to bring a desired sheen to the painting. Over time, this varnish can yellow or crack, especially if the painting has been exposed to a great deal of natural light. If the varnish is yellowed or cracked, it must be removed during conservation. To remove the varnish, a solvent is carefully applied directly to the painting with a cotton swab until all the varnish is soaked up whilst leaving the paint alone. This process can be quite time consuming. Some oil paintings have a rich texture, and removing varnish from the nooks and crevasses of the painting can be difficult. A proper examination with trained eyes is an important ingredient in conservation. If the layer of paint beneath the varnish is also damaged, it too must be restored during the conservation process. To restore the damaged paint, conservators will remove the upper layer of varnish first, and then apply a new layer of varnish before retouching with any new paint. This process is called 'reversible' restoration and is a skill practiced and revered among conservation professionals. In the event of the repainting being incorrect, the process can be reversed back to the fresh layer of varnish and done as many times as needed until the repainting is correct. Paintings produced after 1940 will most likely not be coated with a layer of varnish. In the instance that the painting does not need to have varnish removed, the second step in conservation is to remove the build-up of smoke, dust and grime. Painting conservators employ two different methods in leaning up the grime that has built up over time. The first method is to use a cocktail of chemical detergents to meticulously clean the painting. Because the paint used is oil, they can withstand a careful application of a moist, but not wet, layer of detergents. Proper detergent cleaning will be done only once. Cleaning the painting with chemical detergents can do irreversible damage if done with high frequency. Whatever conservation techniques are used, it is important to keep in mind that this process is done best when not rushed. Some paintings take several years to be completely restored and conserved. 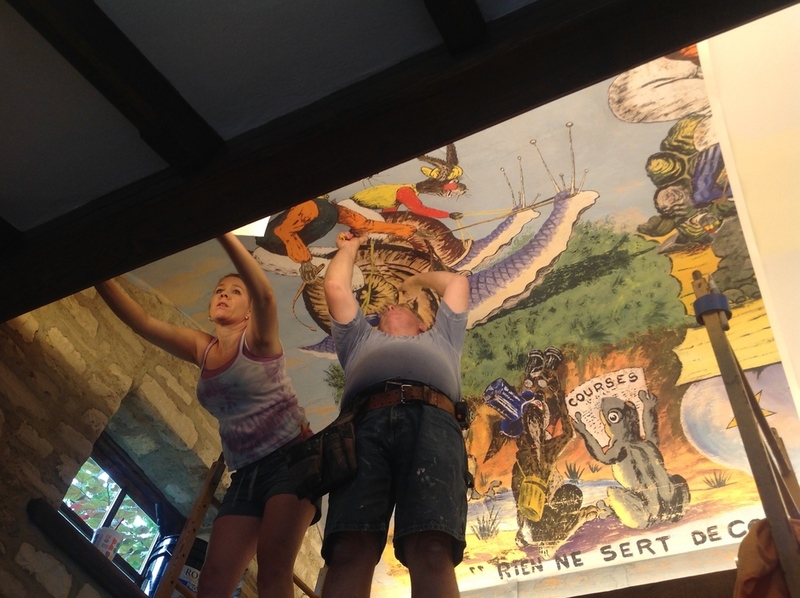 Many oil paintings need to be restored directly on site such as this mural restoration at the Westport Historical Society in Connecticut. Conservators uncovered a whale of a secret in this Dutch painting from 1641. We at VWFA strive to repair every painting that is brought to us. Sometimes, however, the best thing to do is to add a rubber ducky. David Irvine likes to freshen up old thrift store paintings by adding a recognizable character or two. A terrific little documentary about Herb & Dorothy Vogel, a married couple who amassed a gigantic modern art collection on a modest budget.